Three "starters" are common for the first course. Thai food is unique and Thai recipes are not all as complicated as you might think as I discovered traveling from Chiang Mai in the north to Phuket in the south with a nice but not long enough stay in Bangkok in the central part of the country. 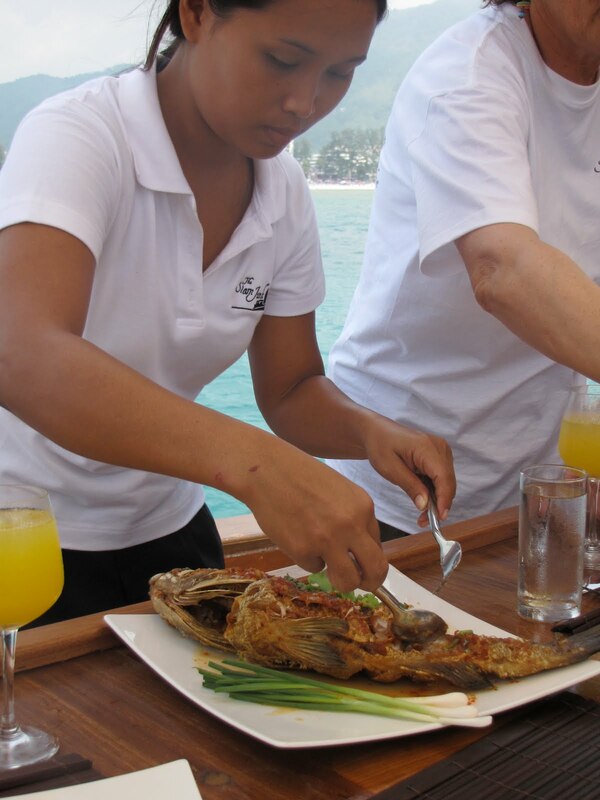 Thai meals are normally served family style with five courses or more. Thais will eat what they want of one before moving on to another while we Americans tend to put a little of each on our plate, taste it all and then go back for more of what we liked best. 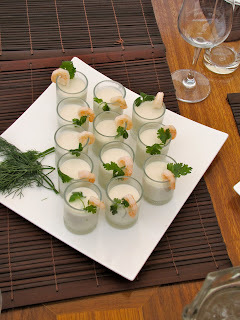 My excursion aboard The Siam Junk provided recipes for favorite flavors that start and end a meal - Chilled Tom Ka Soup Shots with Poached Prawns and Mango and Sticky Rice. Note: Spring rolls were another favorite but you can find them all over Asia so I'm sticking to dishes I've found only in Thailand. This is a popular soup which was served in shot glasses by the wonderful cooks on The Siam Junk. The number of red chilies can be varied to your tolerance for spicy, from one half per diner to as many as 8-10. They said a good average was 8-10 chilies total for this recipe. You definitely want the dish to retain a balance of flavors and not be overwhelmed by chilies. Heat the stock, stir in the lime leaves, lemon grass, galangal, fish sauce and lime juice and bring to a boil. Add shrimp and coconut milk, return to the boil then lower heat to a simmer for about 2 minutes. Allow to cool. When you cool it down the coconut milk and stock tends to separate so give it a good stir before serving. Pour into individual shot glasses, add a whole shrimp to the edge of the glass and serve. 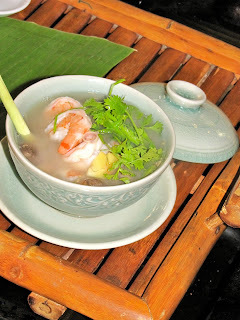 Although not intended as a main dish, this can be served as part of a meal with the shrimp in the soup and accompanied by steamed jasmine rice. Chicken breast cut into bite-sized pieces or even mixed seafood could be substituted. This is surprisingly light despite the calories I know it packs. It quickly became a favorite and I'm not the only fan. The stand serving sticky rice and mango at the Bangkok airport was one of the busiest. Thoroughly wash and rinse the sticky rice and put in an automatic rice cooker or saucepan with a tight-fitting lid and cook according to directions. Leave for 20-25 minutes. Do not open until then - you need the steam to stay in the pot. Place cooked rice in a large bowl. Take a small saucepan and gently heat half of the coconut cream. Add the sugar and half of the salt, stirring until completely dissolved. Remove from the heat and pour into the cooked rice. Mix thoroughly and allow to stand for 15 minutes. Meanwhile, heat the remaining coconut cream and add salt, stirring to make a simple yet delicious topping sauce. 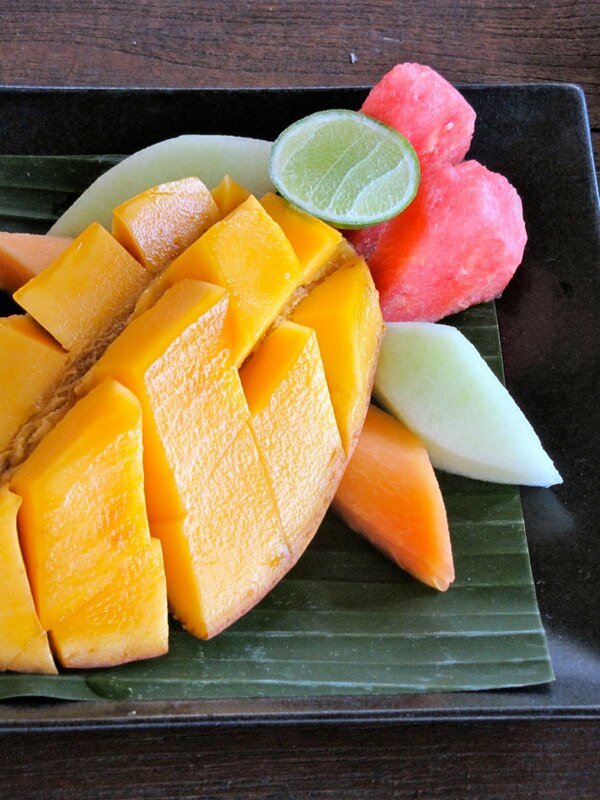 Put sticky rice on a serving platter and arrange sliced mangoes around it. Add some mint leaves for garnish, top the rice with a few spoonfuls of the sauce, serving the remainder on the side. Calories at sea don't count so dig in! 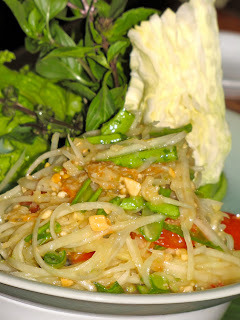 Hope you're not tired of Thai recipes because I have some great ones from Phuket and Bangkok still to share. One memorable day was spent aboard The Siam Junk (that's pronounced SEE-am), www.thesiamjunk.com, a custom designed vessel as comfortable as any afloat. This luxury charter yacht can accommodate up to 50 people for a 7-hour day trip or 12-18 overnight in comfortable, king-size cabins with bathrooms en suite. I was fortunate to be aboard with six other congenial travelers as we went from the eastern side of Phuket peninsula to Patong on the western one. 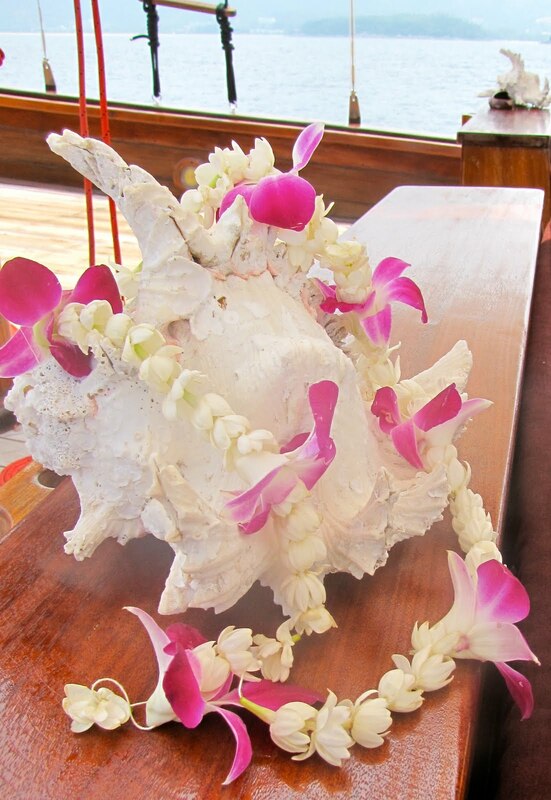 The tranquility of the sea and the tantalizing aromas from the galley as lunch was prepared will never be forgotten. Nor will the flavors as William Patching has generously shared recipes for our repast. I'll share with you, too, beginning with this traditional Thai curry livened up with the Western influence of pumpkin. In a heavy-bottomed frying pan heat coconut cream until simmering. Add the curry paste to the coconut cream and stir well. Once curry paste has been thoroughly mixed in, add the chicken and cook until chicken is done, 5 minutes or so. Add the sliced pumpkin and simmer until it is cooked through. Add white sugar and fish sauce to taste. During what became a two-week-long survey of Thai food at hotels, resorts, spas, spa resorts, hotel resorts and sidewalk cook stalls, dessert was always fruit-based. Beautifully presented platters of sliced fresh fruit and cold coconut milk and fruit soups were standard. At The Vijitt Resort in Phuket, we had a variation - warm coconut soup with bananas. Vijitt is a beautiful spa and resort spread along the hill that rises from Friendship Beach in Rawai on the more sedate, Eastern side of Phuket. It offers its guests Thai cooking classes, too, and while we didn't have time to try it ourselves, the gracious general manager shared the cookbook with us. Heat the coconut milk slowly in a saucepan. Add sugar and salt while stirring constantly. Add banana slices (to keep from browning, dab banana slices with lemon or mild salt) and slowly boil in coconut milk for 5 minutes. Serve warm. This dessert can be made well in advance. Store unrefrigerated to enhance flavor. The cold versions are prepared in the same way with cantaloupe, honeydew melon, pineapple and grapes among the refreshing fruits swimming in coconut milk. NOTE: To find out more about Six Senses Hideaway and Phuket, go to this post at my other blog, Travel on the Level. To complete our meal at Four Seasons Thai Cooking School in Chiang Mai, Chef Pitak presented us with the recipe for Som Tam, Green Papaya Salad, which quickly became one of my favorite Thai foods. I tried it from one end of Thailand to the other, but I think this is the best. 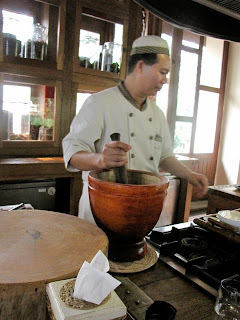 We all got into mashing ingredients in the huge wooden mortar with the equally large pestle, perhaps a sign that travel and food writers/photographers suffer from unresolved aggression. 1. Slightly crush the bird's eye chili in a mortar and pestle. Add the green beans, dried shrimps and cashew nuts and mash this too. 2. Season with fish sauce, palm sugar, lime and tamarind juice. 3. Add green papaya and cherry tomatoes. Mashing and mixing well. 4. Finished salad should have a sour, salty and sweet taste. There's no place for Chef's large mortar and pestle in your average-sized condo so I'm looking forward to seeing just how much smushing and mashing my wooden salad bowl can tolerate. It won't be as physically satisfying but I bet the results of this favorite Thai food recipe will taste great anyway. 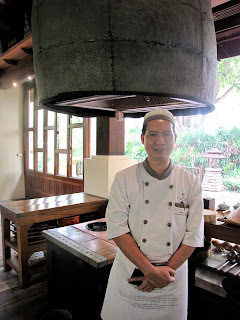 NOTE: For more about Chiang Mai and the Four Seasons, g to this post on my other blog, Travel on the Level. The second dish we prepared at the Four Seasons Thai Cooking School in Chiang Mai was Thom Yum Goong, Spicy Prawn Soup with Lemongrass. With this, Chef Pitak introduced us to bird's eye chili, Thailand's hottest and a mainstay of Thai cuisine. His recipe called for three of the sweat-producers, but then he ate one raw. Watching the perspiration pop out on his forehead and tasting the results of three per serving, I started with one-half, went to one and settled on one and one-half as my upper limit. A native would start with three and add liberally. How hot was that bird's eye chili, chef? That's a stalk of lemongrass added for stirring. 1 1/2 cup prawn stock (make your own by cooking prawn shells and water for 30 minutes). 1. Place the fish sauce, lime juice and lightly crushed bird's eye chili in the soup cup. 2. Heat prawn stock in a wok for 2-3 minutes (if you want a cloudy rather than clear soup, add chili paste and a bit of condensed milk without sugar). 3. Add the lemongrass, mushrooms, galangal and Kaffir lime leaf and bring to a boil. 4. Add the prawns and cook until they turn pink. See? It isn't all complicated. 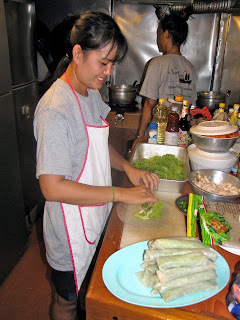 We often relegate Thai food to meals in restaurants, rarely adding Thai cuisine to the cooking we do at home. Thai cooking classes abound, but the best Thai food often requires ingredients not readily available in our neighborhood grocery stores. 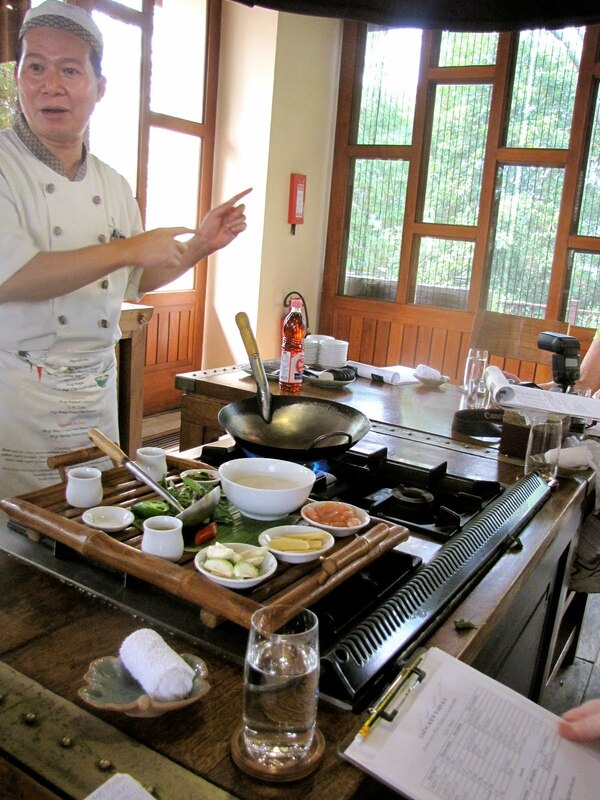 Enter the Four Seasons Cooking School in Chiang Mai, Thailand, and its exemplary chef and chief instructor, Pitak Srichan. Chef Pitak has lived and worked in the U. S. and knows about substituting our ingredients when his native ones can't be found. Having made our offerings of incense and left our wishes at the spirit house, we five foodies sat in a semi-circle around chef's range in the handsome, Lanna-styled pavilion. On our laps were clipboards and three recipes and in our hands were pencils for making notes and cameras for capturing images. 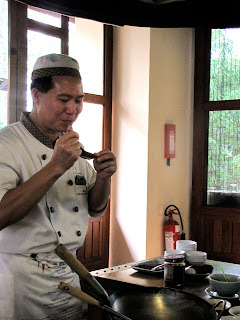 After watching him prepare the three dishes - Gaeng Kiew Warn Kai (Green Curry with Chicken in Coconut Milk), Som Tam (Green Papaya Salad) and Thom Yum Goong (Spicy Prawn Soup with Lemongrass) - and asking questions then tasting the results, we each went to our prep stations to cook them to our own tastes. Then our dishes were swiftly taken to the adjacent dining pavilion where rice and icy cold Chang beer were provided and we settled down to what we later decided was just about the best Thai food we ate during more than two weeks in that beautiful country. Here is the first recipe from this memorable experience. The other two will follow in future posts as will recipes from other special meals we enjoyed from Chaing Mai to Bangkok to Phuket. Note: I have included Thai translation of ingredients where it might help you find them in an Asian market. 1. Heat wok then add vegetable oil for 10 seconds. 2. Combine green curry paste and kaffir lime leaf in the wok and immediately lower heat. Stir to release fragrance. 3. Add the coconut milk (if from a can, shake well). 4. Raise the heat, bring to a boil and add sliced chicken, stirring. 5. Add pea eggplant, chaopaya eggplant and bamboo shoots. Bring to a boil over medium heat until cooked, about 2-3 minutes. 6. Season with fish sauce and sugar, simmering and adding chicken stock if necessary. 7. Add sweet basil leaves and chilies quick stirring for 10 seconds. I know this, like all Thai food, looks impossibly complicated but if you prep ingredients first, cutting and measuring into separate containers, it isn't all that hard. Yes, you'll have a frazzled moment or two, but the dish will be good and no one but you will know.